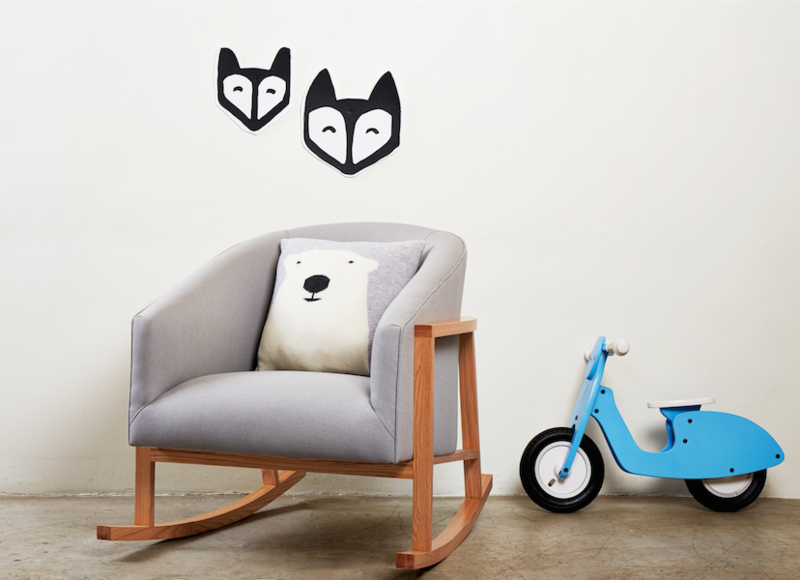 I was so happy to discover new children's furniture design company - Bunny & Clyde. There is a shortage of well designed and thought out children's/nursery furniture design companies, so it is great to see a new brand designing furniture for kids that is contemporary and built to last. 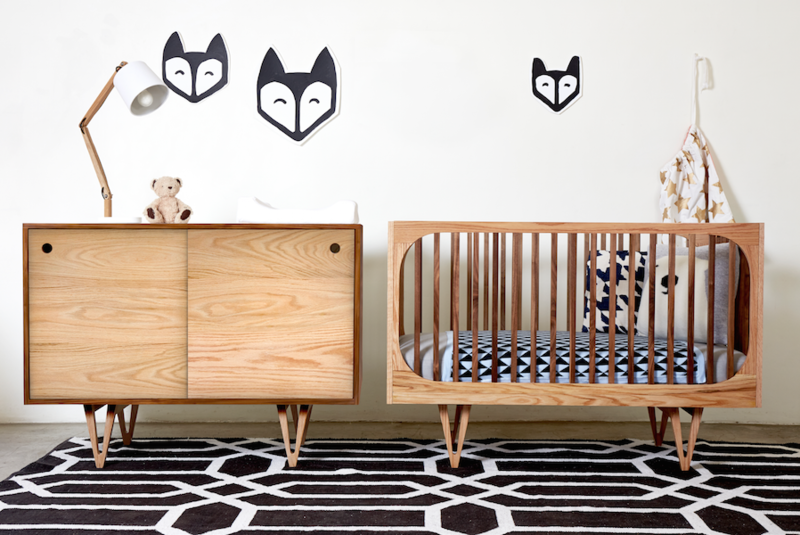 Their furniture is designed so that the pieces all grow with your child and so that they can be used elsewhere in the home - not just in the nursery. 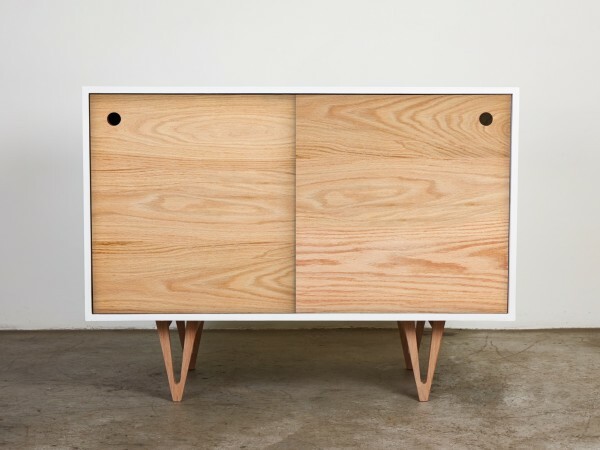 The wood used to build the made to order pieces is sustainably sourced and is treated with non-toxic natural finishes. WHY WAS IT CREATED: A few of us were expecting our 1st children virtually simultaneously and when we started looking for products to fill our nurseries with, we were completely underwhelmed by the choice available to us. Not only was all the furniture we found exclusively for use within the nursery, but everything seemed to be mass produced and very generic in appearance. All three of us share a background in art and design and so we wanted items in our homes that reflected our design aesthetics. Because we couldn’t find what we were looking for readily available, we set about creating our own range of nursery furniture that was design-led; We wanted to create a range that was versatile and timeless so that the initial investment was being made in the nursery, but ultimately, you would be left with pieces that could be used elsewhere in the home. WHAT WE NEED TO KNOW ABOUT YOUR BRAND: We design and handcraft all of our luxury nursery furniture from solid wood. We chose to use solid wood because we love its' natural beauty and how no two pieces are the same – just like no 2 people are the same. We have designed our furniture to be versatile and convertible so that it grows with your children and later, it can be used elsewhere in the home . All of the wood we use is certified as having come from sustainably managed forests, and our materials are all environmentally friendly, recyclable, renewable and in most instances biodegradable. Our Finishes are all 100 % non-toxic and people and baby friendly so that there are zero harmful chemicals coming into contact with anyone in the home. We were born in South Africa but have just launched our range in Europe and as part of our ethos of design-led sustainability, we practice a philosophy of local manufacturing: As a small independent business ourselves, we feel very strongly about supporting and sustaining other small businesses and communities most local to us – Since Nathalie lives in Ireland, all of our furniture for the European market is lovingly handmade and made-to-order by very skilled local craftsmen and women in Ireland. Whilst we know that mass production has its place in industry – it also threatens to sweep aside age old crafts and traditions and it is hoped that through our use of honest raw materials and manufacturing processes that we are in some way able to contribute to keeping those crafting skills and traditions alive. Every piece is special and made exclusively for the family who has ordered it to be loved and enjoyed and then passed down the line as an heirloom piece. Mums and Dads who purchase our products can feel really good about filling their baby’s nursery with our thoughtful socially and environmentally responsible pieces. WHAT WE SHOULD BUY FROM YOU: Our Coco and Harrison Cots with conversion kits - our cots can convert from cots into safety sided toddler beds which your child will use until they are about 5 or 6 years of age. Thereafter, they can be converted into a daybed/sofa. The Coco and Harrison changing stations are all solid assembly construction and so unlike flat pack furniture, they won’t fall apart. They are the perfect accompaniment to the Coco and Harrison Cots and both have a wonderful amount storage space for all those endless bits and pieces. They look great in a living room or dining room too. The Rosaline Rocking Chair is a gift that mums and dads can give themselves – its not just a nursing chair. Supremely comfy and stylish, its a perfect snugly spot for parents and baby to bond and also GREAT for sinking into after a long day or night. It will definitely eventually claim centre spot in the living room.